taking shape along the south wall of the Winnipeg Centre Vineyard Church on Main. To one side, a wash of colours and shapes expand out. A cross-section of land hovers just below a a diving narwhal. A primitive blue-faced figure holds a large fish to its right. All are encapsulated by two expansive blue lungs, lending the piece its name, Aqua Lungs. Further along the wall, an Indigenous woman with a crown of muskox pores over a human heart, stitching it together with needle and thread. The piece, titled Mending, is artists' Bruno Smoky and Shalak Attack’s way of remembering Missing and Murdered Indigenous Women. The murals launch on the night of Nuit Blanche, and will serve as the end-point for the Rainbow Trout Bike Jam. Cyclists and other visitors will be treated to a free concert, youth arts programming led by Graffiti Gallery artist Jessica Canard, and a barbecue. The project is part of a larger plan by Synonym Art Consultation, Graffiti Gallery and the North End Community Renewal Corporation. Synonym co-founder Andrew Eastman explains, “We want to bring colour and safe community spaces to this area." 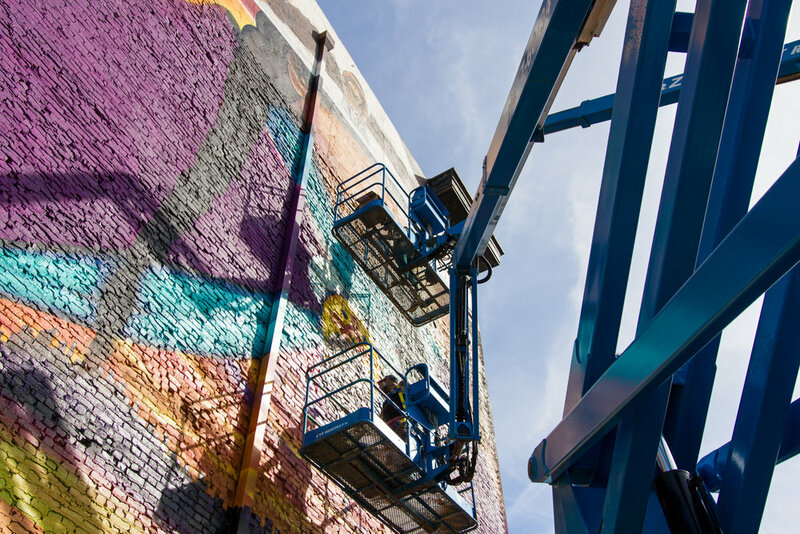 For more information about events, murals, and to connect through social media, check out Synonym Art Consultation's website.